Satopanth Tal is a crystal clear green water, the triangular lake at an elevation of 4600 meters above sea level and is adorned in the midst of the snow-shrouded peaks. Satopanth Tal is a high altitude lake located in Chamoli district of Uttarakhand and near to Badrinath Shrine. 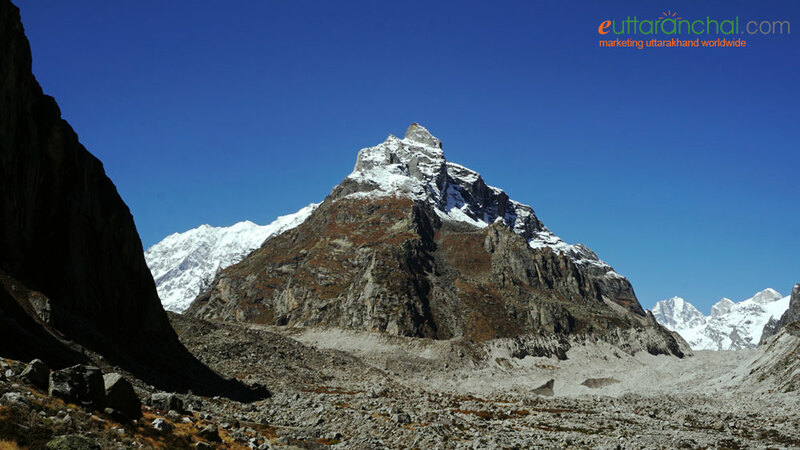 Apart from religious significance Satopanth also become one of the Popular treks in Uttarakhand. 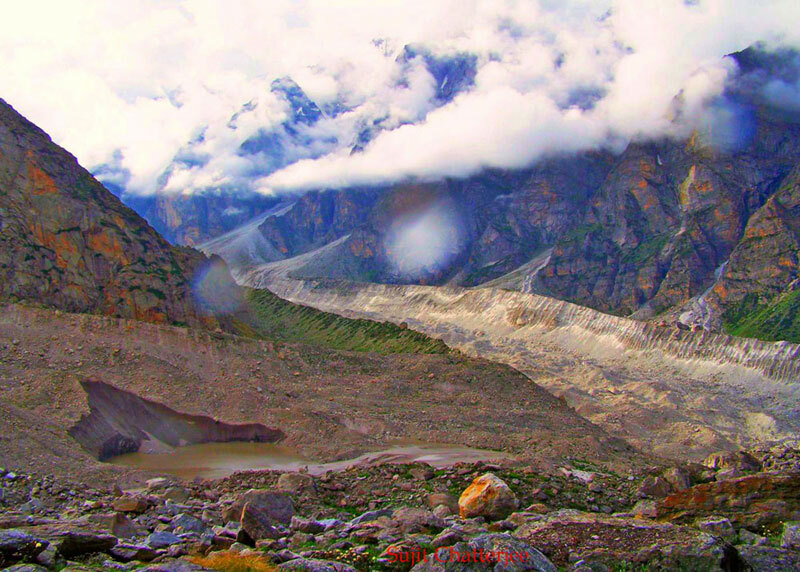 This glacier trek offers majestic views of Himalayas. Why you should gear yourself up for the venerated Satopanth trek? The pea-green Satopanth Lake is celebrated for its holiness and mysticism which tempts many avid travellers to gear up for commencing the Satopanth Tal trek. The virgin trail leading to Satopanth can be easily accessed by crossing Lakshmi Van and Chakratirtha. 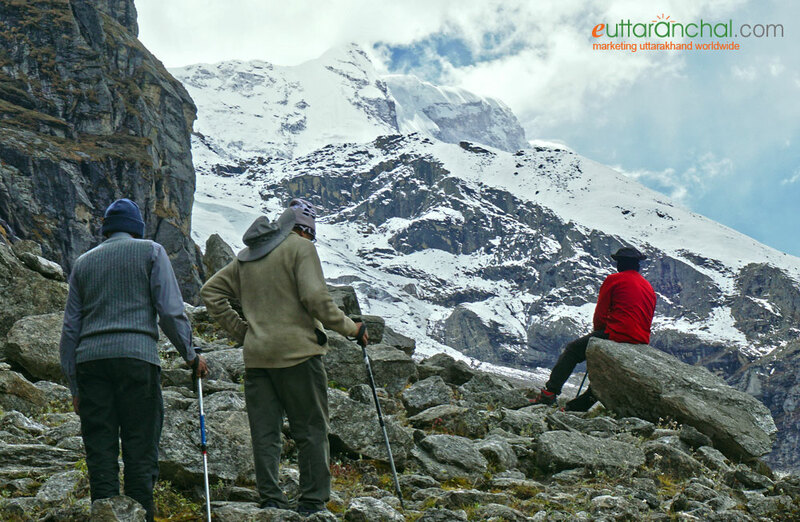 This rewarding trek will offer you unobstructed view of the snow crested Chaukhamba and many other peaks. You will have euphoric spiritual as well as mental bliss while reaching at this lake. The trail to the lake rewards trekkers with abundant natural beauty in the form of snow-clad peaks, verdant hills covered with pine and oak trees,gushing rivulets and streams. Early morning catch the bus to Badrinath from Rishikesh and have lunch en-route. On reaching Badrinath, pay obeisance at the Badrinath temple and take the blessings of the deity. Check it at a hotel, have dinner and overnight stay. Post breakfast, check out from the hotel and commence a short 3 km trek to Mana (you can take local taxi as well), the last village of India on the Indo-Tibetan border. After getting your permits checked, make your advancement towards the Vasundhara Falls. After crossing the Saraswati temple from Mana, the gradient of the trek will become steeper. Walk in harmony with the mighty Alakananda River, flowing below. After a couple of hours, the surging sound of the water plunging from a height will suddenly hit your ears. On walking closer to the sound, the sight of Vasundhara Fall will come into your eyes. This cascading waterfall has medicinal properties and has been scientifically proved. Absorb the beauty of the waterfall and start treading through the thick birch forests of Laxmi Van. Walk 4 km further on the moraines and you’ll come across your campsite at Laxmi Van. Capture the beautiful sunrise view and gear up for today’s trek. This is a short yet scenic trek which will cross the Satopanth Valley. The well-marked trail is dotted with the green patches amidst the vast terminal moraines of Dhano Glacier. On the way, you can see the colourful alpine flowers blooming in the valley, after which the glorious view of the three benevolent peaks of Bhagirathi will first appear at the Satopanth Valley. Gradually climb the steep ridge of Sahastradhara to Chakratirtha camping grounds. On reaching the campsite, roll on the ground and gaze at the glaring west face of Mount Neelkanth. Unzip your tents early morning, to have a tempting view of Chaukhamba in the centre, Neelkanth, Satopanth and Parvati Peaks on your left and Balakun on your right. Sip a cup of tea, while getting drenched in the enigmatic aura of the colossal hills. Now get ready to meander through the puzzling maze of boulders and moraines. You may also hear the perpetual tumbling sound of the avalanches throughout the valley. This is a tricky stretch so be patient while crossing it. In the last 2 km trek, you may have to deal with a couple of steep slopes and walk over the loose soil scattered over the glacial moraines. On reaching the top of the ridge, you will see the first sight of the triangular shaped, Satopanth Lake. The breath-taking views from the emerald lake will sweep you off your feet. You can also see a saint known as Mauni Baba who resides near the lake and has stopped talking from a very long time. There is a common belief that he can live on only sun and air if food is unavailable. After spending some time here, start descending to Chakratirtha campsite. The 5 km return trek to Chakratirtha can be completed in a couple of hours. Wake up to the chirps of the playful birds, post breakfast pack your tent to start descending all the way down to Mana village. Follow the same trail that you took for reaching Chakratirtha from Mana. This 15 km trek can be completed in 5-6 hours. On reaching Mana, take the taxi ride to Badrinath, check in at a hotel and have an overnight stay there. Sirsendu Gayen : Snow fall at Badrinath - Devotees are waiting for their turn to enter in the temple. After having a nutritious and healthy breakfast, check out from the hotel and leave for Rishikesh. 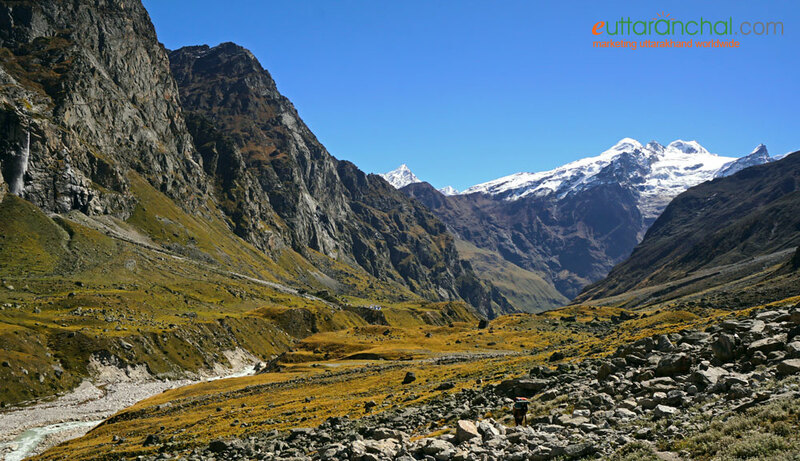 Trek to Satopanth Tal is moderately difficult and hence requires the trekkers to be physically fit. Cardio-vascular exercises like running, swimming could be practiced to improve stamina. It is recommended that to take the service of experience guide or trekking company for Satopanth Tal trek. You can also check Satopanth Tour packages from eUttaranchal as well. During the monsoons months (July-August), it is better to check with weather and road conditions with the local authorities and tour operators before travelling to the destination. Best time to visit Satopanth Tal is during the months of May, June, September and October. Nearest railhead is at Rishikesh while the nearest airport is situated at Dehradun. Obtain inner line permits from the Forest Department in Joshimath. The weather conditions and the gradient make the trek more difficult than it may appear. Last market is in Badrinath, do all preparations in Badrinath or Joshimath itself. According to the Hindu legends amd Mythology, the Tridevas or the three devas, Brahma, Vishnu and Mahesha (Shiva) mediated on the corners of this lake. It is believed that during every Ekadashi the trinities take a holy dip in the water of Satopanth Lake. The Hindus believe that taking a bath in the Saptopanth Lake on the 11th day of the solar and lunar fortnights is considered to be auspicious. Locals also believe that some special type of birds are found here, which pick up the pollutants of the lake and thus keeping the lake clean. These birds are not found anywhere else. The local belief is that they are the Gandharvas perdue, who guards the lake against evils. The Hindus believe that Goddess Lakshmi and her husband Narayan indulged in a penance at Lakshmi Van and Chakratirtha. There is an interesting story behind the indent created at Chakratirtha which states that Narayan once kept his Sudarshana Chakra on the valley and due to its weight the valley got its round shaped meadow surrounding the lofty mountains. With its emerald blue-green crystal clear waters the triangular lake, having a perimeter of 1 km is situated at an astounding height of 4400-4600 meters (15100 feet). Satopanth Lake is 25 km from Badrinath shrine and about 4 km from Chakrateerth. 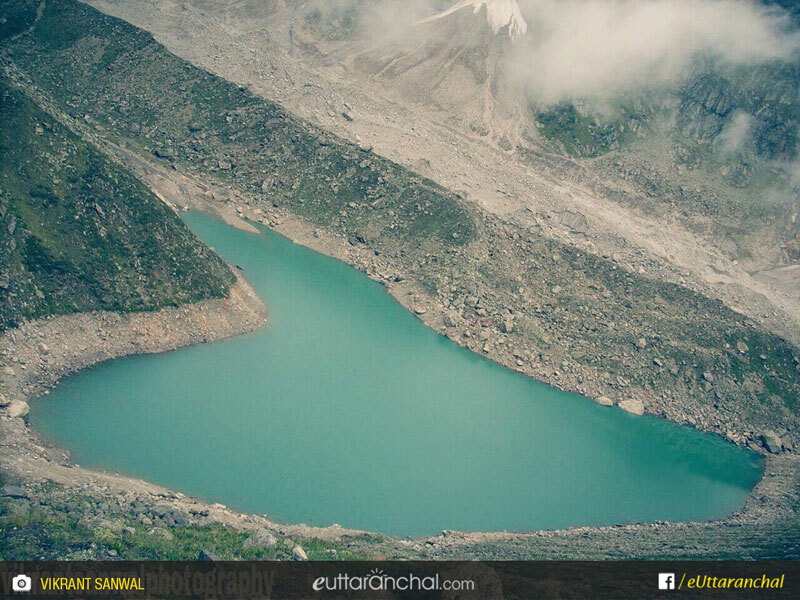 This pristine lake is situated on the base of legendary Neelkantha Peak. The travelers can relish the stunning views of the glorious Balakun Peak, Kuber Top, Mt. Nilkantha and Mt. Swargarohini which are visible en route. There is a saint known as Moni Baba, who hasn’t uttered a single word from years. There is a common belief that he can live on sun and air if food is not available. What is Meaning of Satopanth? Satopanth word is derived from two words – ‘Sat-o’ meaning of truth, and ‘Panth’ meaning path or way. So its literal meaning is the path of truth. Satopanth Lake has three corner and each corner of Satopanth Lake is named after divine Trinity of Brahma, Vishnu, and Mahesh. The lake considered sacred by the local people of Mana village, which is base camp village for Satopanth Lake. 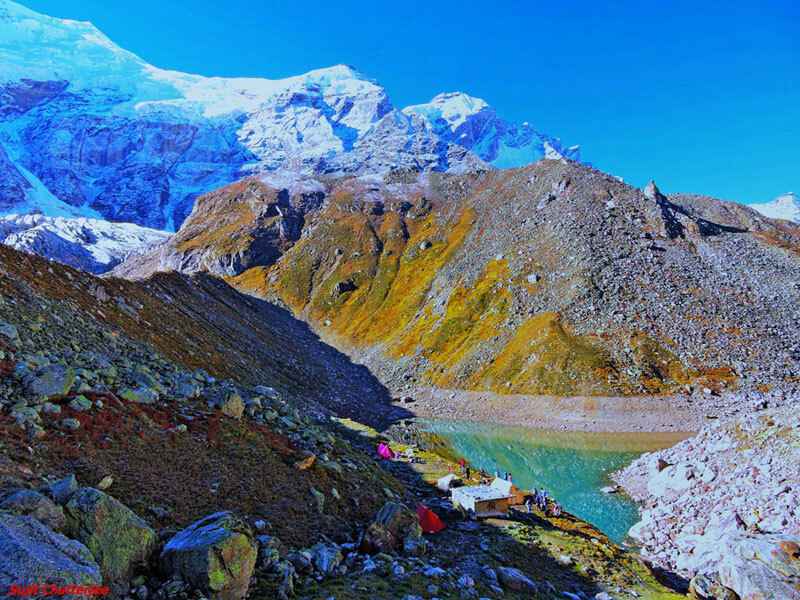 Satopanth is also known or written as Satopanth Lake, Satopant Tal, Sathopanth Tal, Sathopanth Lake trek, Satopanth Glacier trek. Sometimes it is also known as Satopanth - Swargarohini Trek. What is Satopanth Trek famous for? Satopanth Trek is famous among tourist as Trekking, High Altitude Lake, Mythological Importance, Camping, Glacier, Pilgrimage. Satopanth Trek is recommended destination for Foreigners, Groups, Solo. Satopanth Trek is popular destination for following activities/ interests - Adventure, Camping, Lakes, Pilgrimage, Trekking. Satopanth Lake remains frozen during from October to May. Travelling to Satopanth Trek in 2019? Contact us for planning your Satopanth Trek tour with best travel packages of as per your requirements!